After arriving in Tallinn we have already startet to explore the famous old town. Here the grand old cathedral of Estonia. 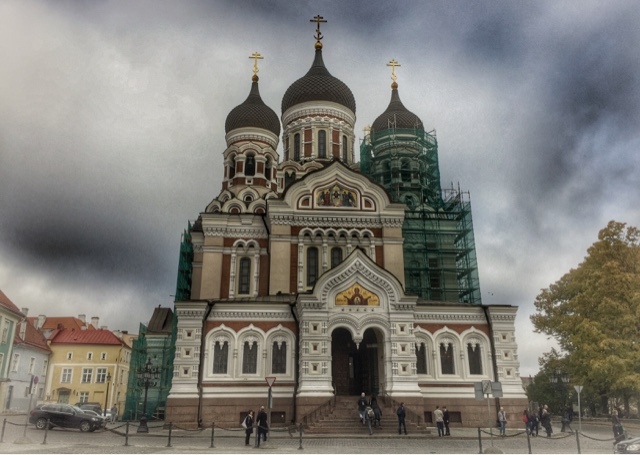 The Alexander Nevsky Cathedral is an orthodoxcathedral in the Tallinn Old Town, Estonia. It was built to a design by Mikhail Preobrazhensky in a typical Russian Revival style between 1894 and 1900, during the period when the country was part of the Russian Empire. The Alexander Nevsky Cathedral is Tallinn's largest and grandest orthodox cupola cathedral. It is dedicated to Saint Alexander Nevsky who in 1242 won the Battle of the Ice on Lake Peipus, in the territorial waters of present-day Estonia. The late Russian patriarch, Alexis II, started his priestly ministry in the church.